The Chinese won their biggest game in basketball history Saturday, beating Germany 59-55 to advance to the semifinal round of the Olympics. As the host country, that was their goal heading into the Games, and they accomplished it despite doubts they could get out of the “Group of Death” that includes the USA, Spain, Greece and Germany. The pressure was immense leading up to the game because if China had lost, they most likely wouldn’t have advanced, and the Olympics for them would have been considered a failure. The Beijing crowd did a fantastic job yelling and screaming for its team on every rebound, free throw, and anything positive its team did. Just like they did against Spain a couple of games ago, China blew another big 4th quarter lead. They led by 13 points with 6 ½ minutes remaining in the game, but Dirk Nowitzki and Pascal Roller brought them back with a flurry of points. However, with the Germans relying on Nowtizki to do most of the work, he ended up making a couple of mistakes late that hurt Germany’s chances. He was called for traveling with 2:30 remaining, and with 40 seconds remaining he charged into Yao Ming for an offensive foul. On the ensuing possession with China only up 56-55, Yi Jianlian hit the biggest shot of his life, nailing a jumper with one foot inside the 3-point line to give China a 58-55 lead, sending Yao Ming and the Chinese crowd into even more of a frenzy. Although Yao was tired, he and Yi jumped into the air together to bump chests to celebrate that huge bucket. Notwitzki had a chance to tie the game with a wide open 3-pointer (incredible that he was left wide open), and luckily for the Chinese he missed. Yao grabbed the rebound, was fouled, and hit 1-of-2 free throws with 18.8 seconds remaining to make it 59-55. The Chinese sealed the win after stealing the ball from Germany as they brought it up the court, starting the party inside Wukesong Indoor Stadium. Yao hit some big shots in the fourth quarter on his way to scoring 25 of China’s 59 points on 9-of-19 field goals. He also grabbed 11 rebounds, had 2 assists, 1 block, and turned the ball over only 2 times. Playing 34 minutes of the game’s 40 minutes, Yao was noticeably tired, but he gutted it out to propel his team to the win. China got off to a hot start, leading 19-9 at the end of the first quarter, but Germany came back strong to lead 31-27 by halftime. Although Germany was only 8-of-33 from the floor at the half, they made up for it by hitting 12-of-12 from the free throw line. But China roared back in the third quarter, scoring 8 points in a row after halftime to take a 35-31 lead. They led 47-39 after 3 quarters, outscoring Gamany 20-8 in the third before holding on for the victory down the stretch. You’ve got to check out the photos in the forum of all the celebration that Raymond has posted. I watched the game and got chills down my spine for Yao as he pumped his fist and encouraged his teammates with intensity after every good play. This entry was posted on Saturday, August 16th, 2008 at 10:21 am	and is filed under 2008 Beijing Olympics. You can follow any responses to this entry through the RSS 2.0 feed. A difficult game for me, being a big Yao-fan living in Germany. Anyway, it seems Yao has expanded his outside repertoire with another three! I hope Yao can bring this swagger to the Rockets! I hope Dirk get traded out of Dallas, so I can enjoy the Rockets wipping Dallas more, haha. I’ve never watched a game with so much nervousness and excitement. Be honest with you, I’ve never thought China could advance out of this group. The difference has been China’s role players, they have stepped up when needed. They are playing a lot better team ball than in the past and they definitely deserve this win. 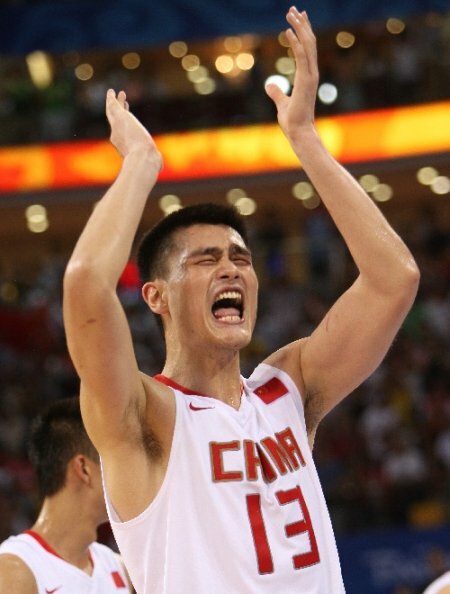 Congratulations to Yao and CNT!!! 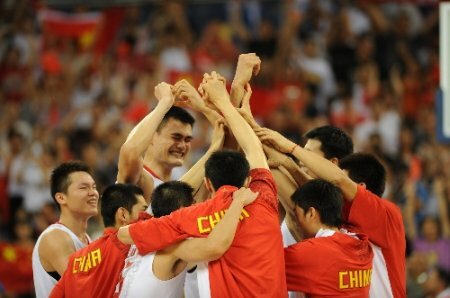 I hope they rest Yao more the next game against Greece so Yao can stay rested for the next round!!! The funny thing is, the CNT is the opposite of the stereotype of asian athletes – they are supposed to be smaller but quickier then their european/american/african counterparts. In other words: good guard, weak big man. In the CNT they have a terrific inside presence (WZZ, Yi, Yao) and forgettable guards, dunno why. Anyone could explain the crappiness of CNT’s backcourt? Something wrong in the training at the youth level? I agree with Joe, Sun Yue should have been running the point and handling the ball in the Spain game. We would have won that one as well. I understand Coach Kaunas sticking with Liu Wei because at this point, even though Chen Jianghua is more talented, but Liu Wei has a little more control. But I thought Sun Yue should’ve been used more at the point as well. That Rubio kid would never have been able to strip Sun Yue without fouling. From the way it looks, if we beat Greece, we play Argentina. If we lose, we play Lithuania. I’ll take my chances with Lithuania. Interesting to see how Kaman looked sheepish and completely avoided eye contact with Yao when they shook hands after the game. It was also great to see Yao putting his arm around Wang Zhizhi’s shoulders as both of them looked on and smiled towards the final seconds of the victory. In Yao’s bio, he had sounded a bit resentful that Wang never deigned to speak to him when he (Yao) first joined the national team many years ago. So good to see these giants of Chinese basketball become real buddies. By the way, what a slugfest international games are compared to what you see in the NBA. There were so many times in the game when my jaw dropped looking at what the refs were allowing out there. No wonder international players come into the NBA and immediately become fouling machines until they learn.